Earn $3.29 in Rewards credit. Click to learn more. The Frame Pack is a great way to carry snacks, tools, clothing, or other small items. 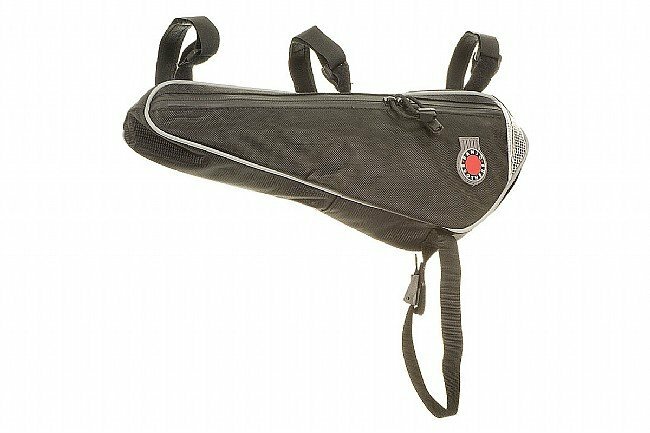 Banjo's simple design features two pockets -- one full sized cargo pocket, and one smaller flat pocket with a wallet pouch and key clip. 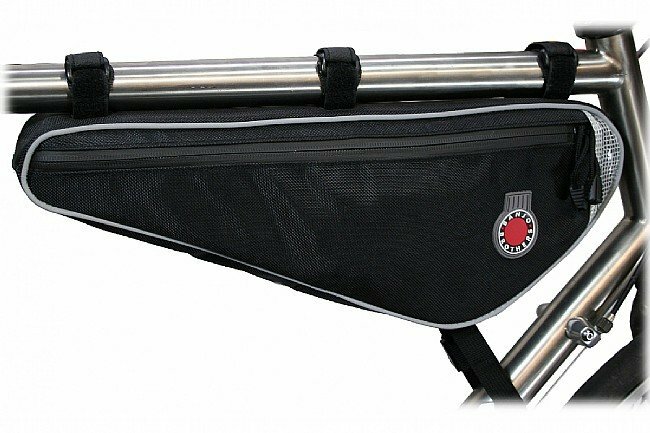 Three cut-to-length attachment straps fit oversized tubes up to 3 inches in diameter. The Banjo Brothers Frame Pack is available in Small and Medium. Small: 14.25" x 4.25" x 2" / 70 cu in. Medium: 15.5" x 5.5" x 2" / 102 cu in. This would be an excellent bag if they would have made the length slightly shorter so you could grab your water bottle easier. Used this for a week long tour, needed a spot to carry heavier tools. It it's job perfectly, and was easy to install. I was pleasantly surprised at how much stuff I could get in the pack. The pack met my needs/expectations and was very useful on my longer rides. Straps are a little long for most bikes (why the 4 vs. 5 star rating), but I did not trim them until I see how it will fit on my N1 bike. Latches are also nicely padded to protect the bike finish and the pack doesn't interfere with pedalling. It's a good investment for those of us that can't get everything in a seat pack we'd like to have on a ride. Good job Banjo Brothers. 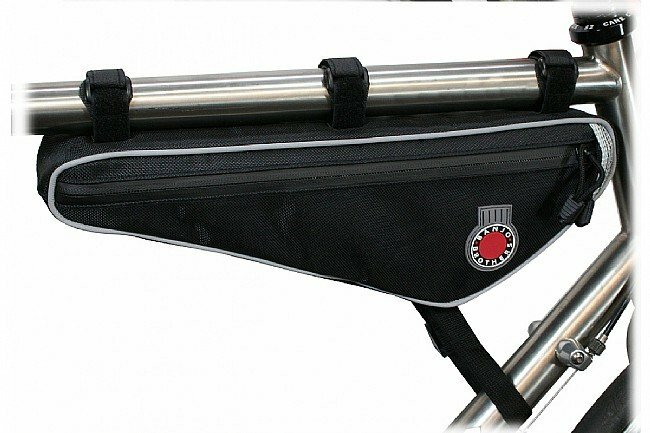 I searched long and hard to find a partial frame bag, looking up dimensions, making paper templates to see how this or that bag would fit on my bike and how it would impede access to water bottles. I ended up choosing this one because it had the largest volume while seeming to fit well enough on my bike and it has fit the bill, so to speak. The only caveat is that I had to install it backwards to avoid interference with my downtube water bottle. If you have a level top tube road frame, I would expect anything 54cm and up would fit this bag as intended. Sloping top tubes make things more difficult, but I suspect a 56cm frame with sloping top tube would fit OK. My 54cm sloping top tube needed the backwards mounting, plus lowering my bottle cages as low as possible to fit both a seat tube and down tube cage. I even ended up using a cage lowering adapter (home brewed with aluminum plate and lock nuts, resulting in a lower profile than the Shimano Di2 cage adapter or similar items. A side entry cage on the down tube also makes things work better. With the bag itself, I like that it has two separate, full length, but asymmetrical width, compartments and two way zippers. I haven't had to test its water resistance so I can't offer any opinion there. If there's one thing I would ding it for is that the faux leather covering the velcro is a bit flimsy and one piece tore on the first day of use. It doesn't impact functionality and isn't very noticeable, but I thought it worth pointing out. I can carry a spare tube, a bunch of tools, patch kit, micro pump, wallet, keys, a few snacks, all with no leg interference. Small fits just right in my gravel grinder frame, its a nice pack to keep things off your back. Fits my pump, spare tubes, food, tools etc. Coupled with my seat pack, I can carry plenty of stuff. Drawback is that it makes water bottles hard to get at if you have a top tube that slopes down, as many bikes do. Still, I'm glad I bought it for those long rides in the boonies where you have to carry all your own tools and several tubes and a pump. Beefy bag, holds a lot of gear. This bag has extra long straps, which can get in the way when installing. Also, placing it on a smaller frame makes it somewhat difficult to use the water bottle cages. It's still a great bag for days when you need to bring some extra gear and don't want to bring a Camelbak.